Found out a few days ago that I have won Second Viewers' Choice at the Sydney Quilt Show. 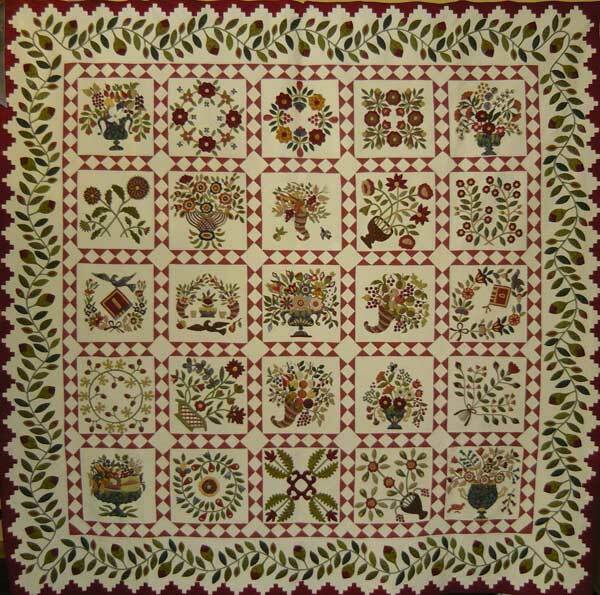 Rhonda Pearce won first prize with an amazing applique and Raconteur came in second. 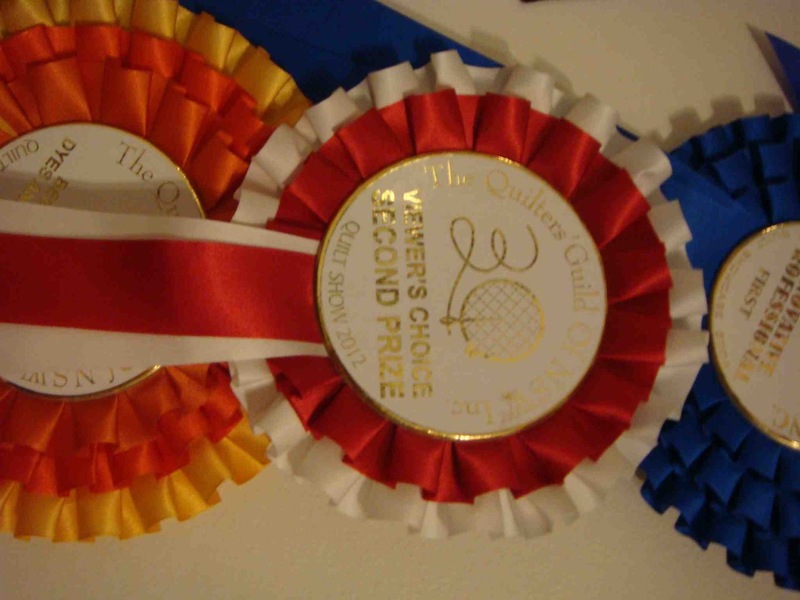 Well today my parcel arrived from the guild and not only did I receive a gorgeous ribbon but also some beautiful fabrics from Charles Parsons. 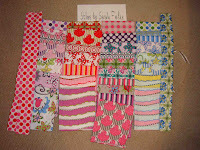 The fabrics are called St. Ives by Sarah Fielke and will be my next challenge. I have never worked with designs such as these. It will be interesting to see what I can come up with. 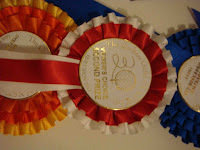 Well here it is my ribbon. Doesn't it look great. Oh I still find it hard to believe. 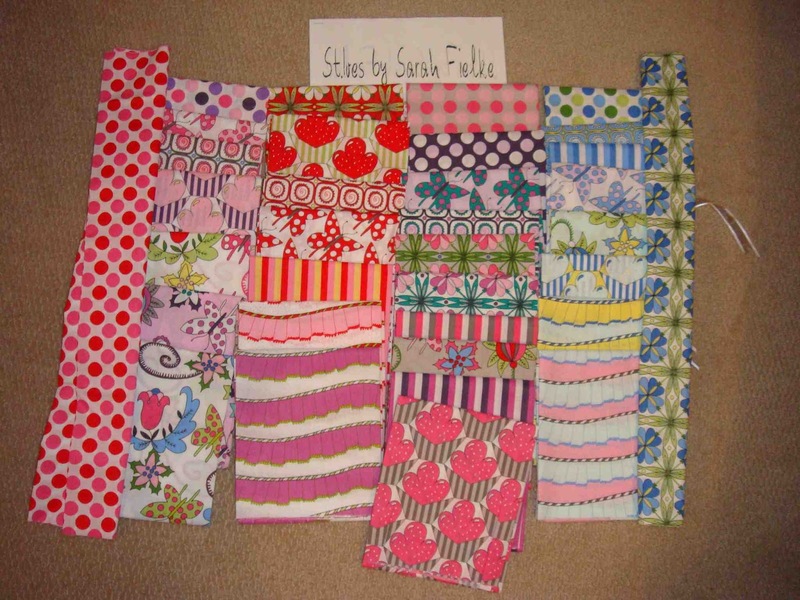 Besides the ribbon Charles Parsons donated 28FQs from the St. Ives range by Sarah Fielke for the prize. I think it must be the entire range. 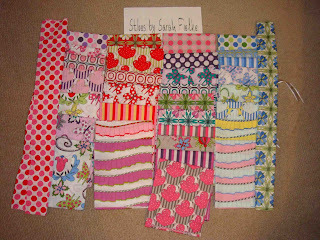 I have absolutely no idea what I will do with these as they are so far out of my comfort zone but I know that I have to start making a baby quilt for a niece who likes modern things and so I suspect that these will be the highlights. Woo who!! 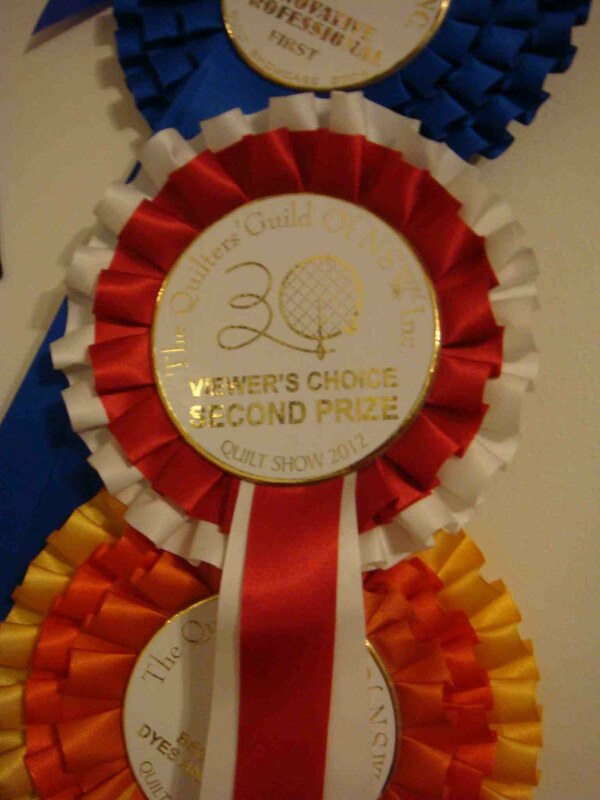 Just found that I received second viewer's choice at the Sydney Quilt show. Can't believe it. 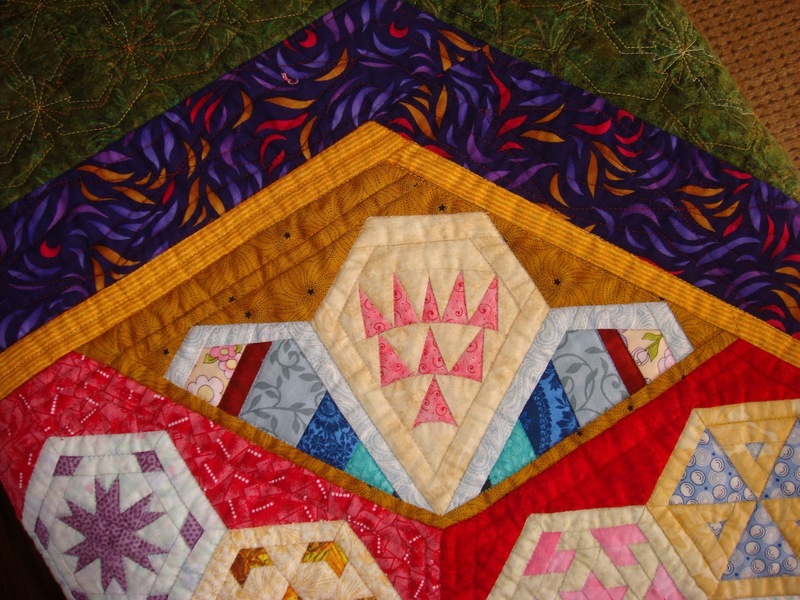 First entry was this stunner of an applique quilt by Rhonda Pearce. I could say that one day I will make a quilt like that but that would simply be a complete and total lie with absolutely no chance of my even thinking of starting it,let alone putting needle to thread and fabric. 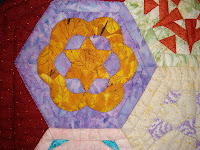 Applique is generally a favored technique in the Sydney Quilt Show and so I even included some in Raconteur. My first attempt was the tried and trusty buttonhole version but I knew that wouldn't cut the ice in the professional category..even though my stitches were perfect and exactly the same size throughout. I suppose that was the problem machine buttonhole isn't really that difficult to manage these days. 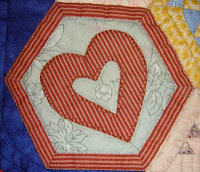 So for my second attempt I tried needle turn applique and even choose a difficult circle. Ok so a circle doesn't have many points as such. Well yes when you put it like that I do have to agree that it doesn't have any points but isn't that why I chose it? and I did turn them over some cardboard, using a needle.... and tack them then iron them to size and also baste them into place before appliqueing them onto the background fabric. Then finally in an attempt to include some 'real' applique I decided to do broderie perse, as a friend who once tried to teach it to me said, 'It is a great technique as no-one knows where your piece should start or finish.' And so I ventured into the broderie perse exercise. After several attempts I realised why I hadn't spent much time doing it previously...no matter that someone might not know where it should start or finish it wasn't that easy if everything looked like a great big blah!! Now I know you will say but it looks good and I must admit without a shade of blushing that in real life it looks fantastic. So why the fantastic result after such a dismal effort. The reason, which I will reveal shortly, is the same reason that my next block is also super fantastic. I have to admit that there is no short cut to precise points, both inward and outward bending, nor to curved curves. It is just practice, practice and more practice. Many years of it I must admit. I suppose while I'm admitting things I should also admit that Merelyn Pearce did both of these lovely little blocks for me. So if your applique skills are as good, or more precise atrocious, as mine simply find a friend. For those non-Australians reading this let me just say that Merelyn does unbelievable applique and has won Best of Australia with her applique quilts a record three times, she generally doesn't applique anything as simple as this... it was my design choice and her skill...perfect match? You won't believe this but if you look closely at the cover for the previous post you will see that I have misspelt my own name in my email addy. Just for fun I think I will redo all of the covers tomorrow. Phooey! It's funny but I finished this a few days ago and it was only last night while I was talking with my son on Gvideo, similar to Skype but with less interference. Anyway as I was talking with him I was trying to upload this onto the net when I realised that I had an error in it. 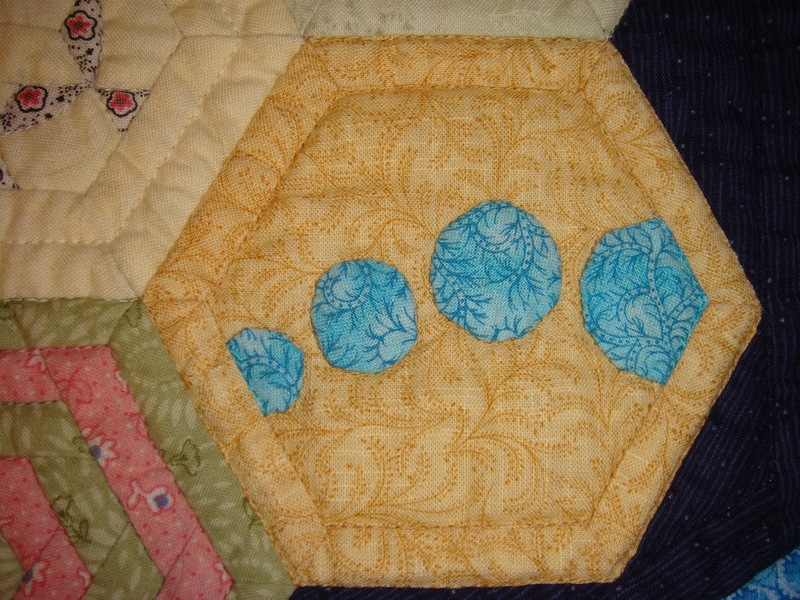 I had written the edge length for the small hexagons but the length across the longest middle for the large hexagon. Wouldn't have been so bad but I have been busy scaffolding my patterns for the past week and that part was already set up in ALL of the blocks. Oh well gave me something to do this morning....copy and paste the samething many times. Hopefully I don't run across another repeated error. Anyway what do you think of the cover layout? I have been writing up my patterns when I thought someone might ask why didn't I call the first collection, Collection 1. 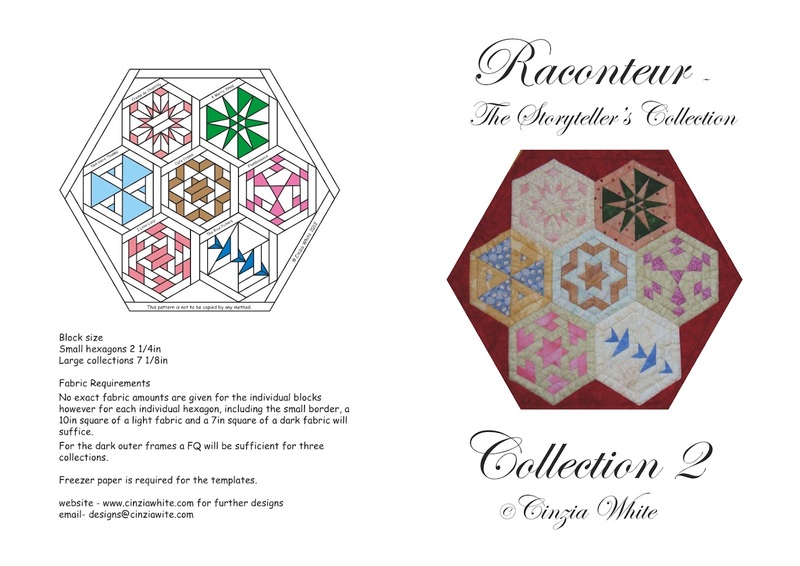 Well the reason for this is that when I made Raconteur so as to not muck up the placement I numbered every collection left to right, top to bottom... including the corners and half blocks. So as you can see Collection 1 is a corner block. If I manage to get around to marketing this pattern I think people will want to start with full blocks rather than corners and so I figured I would start by writing those up first. 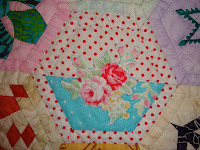 Secondly I will do the half blocks and then finally I will do the corner blocks. I think I will put all of the half and corner collections together into one collection, but I will worry about that when I get there. But for now I will simply work on the full blocks. Mind you this was one of my favourite blocks. Yes that's right I have managed to write up the instructions for the first of the 59 collections. Well actually the first of the 49 full collections. I am sure the part blocks aren't going to take me anywhere near as long as I have already completed the foundation papers for those. It took me three days to write up all of the instructions and then my laptop wouldn't talk to my printer...temperamental thing! Anyway as the laptop wouldn't talk to the printer I had to transfer the file onto a thumb drive and then onto my Mac. All was going well when Charmaine phoned. So of course being of the modern age I figured anyone can multitask when the only tasks I am needing to do are copy onto a thumb drive and talk. Not hard you say. Unfortunately my thumb drive was too full to take the file. So no problem all that was needed was to delete some stuff off the thumb drive... some things like old back up files of my past three days work. Delete..still not enough space....delete .. more space needed.. I know the problem is that I haven't been emptying the recylce bin so although I have dragged the files away they are still taking up space....seemed logical to me. empty bin... 'are you sure? asks polite PC. "you bet I am ... so away it goes. Now to drag across file.... It's gone!! Oh phooey. I hadn't been clearing out my thumb drive I had been clearing out my hard drive! Including my back up files. Three days work down the drain! 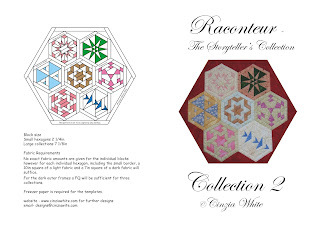 Raconteur - The Storyteller's Collection. Well I have finally finished it. Only six years in the making but it is finally over and done!!! Lots of numbers to please the mathematicians among you. 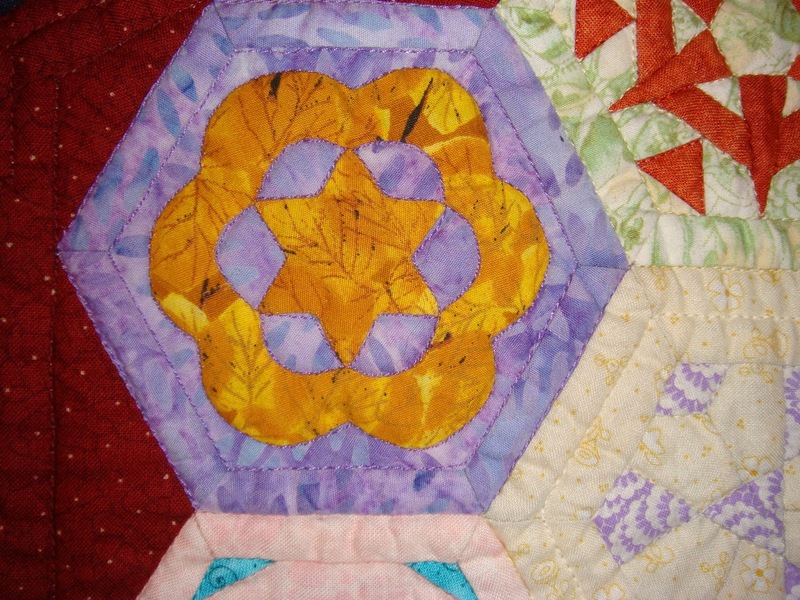 There are 49 full blocks, 8 half blocks to fill out the sides and 4 corner blocks to taper the corners. 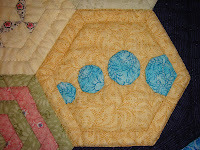 Each small hexagon, called a block, has a side length of 2 1/4in AFTER the borders are added. Put seven blocks together and you have a collections. 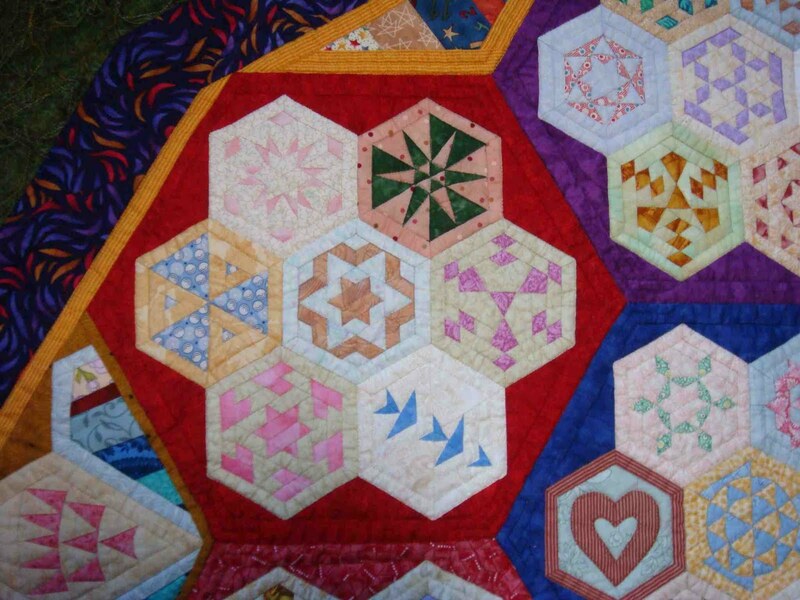 Add a frame around all of those to make it into a larger hexagon with sides of 7 1/8in. So you can see we are talking about big blocks.. well they are big when they reach the collection stage. I counted the pieces and came up with 13931.. a palindromic number. To confirm my numbers Paul then counted them and came up with 14,281.... close but not really. Anyone else want to count? I must run now so check back in a week or so for further info if you are interested in how this darling quilt came to be. Ok I have been very quiet for quite a while now but there is a good reason for it. 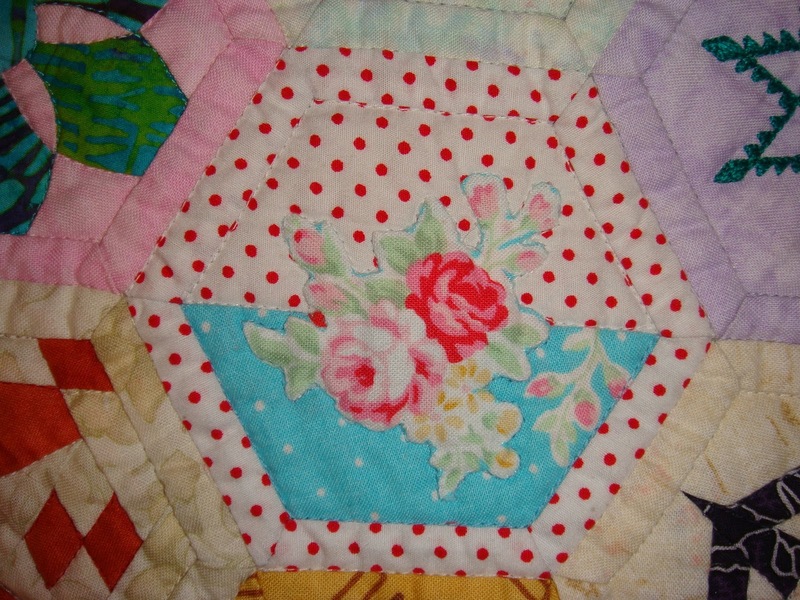 I have been quilting. Now isn't that reasonable. 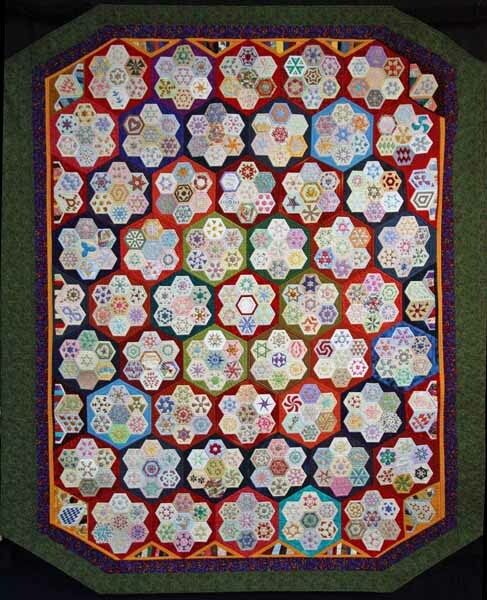 I have been for the past six years making a king size miniature quilt. That doesn't make much sense does it? 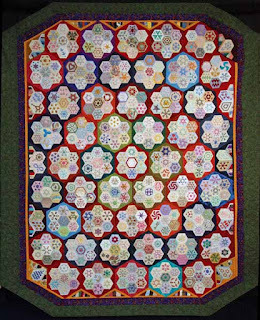 Well what I mean is, it is a king size quilt but it is made of miniature blocks. That is probably why I can't seem to take a good photo of it. You see the reason it appears to sparkle in places is because each of those blocks is only a miniature and most people take photos of miniatures close up. However closeup you can't see the whole quilt. So therein lies the problem. 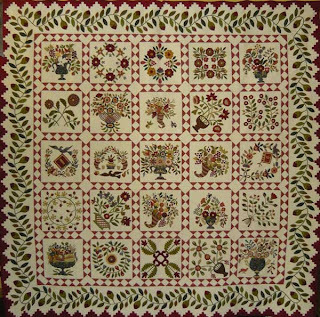 Anyway I am now going to try to write up the patterns for this quilt. So the fun begins.